It wasn't that long ago that I was enjoying a hibiscus beer and now here comes along another one. Beers made with the tropical flower aren't exactly ubiquitous but they're not rarities that come around as often as Halley's Comet either. Here in the Madison area we've got Vintage's Hibiscus Saison that heralds the arrival of warmer weather every spring; starting this year Revolution's Rosa now also heralds that meteorological change for we Cheeseheads. 5 Rabbit's Huitzi features the flower as does Milwaukee Brewing's Weekend @ Louie's. And surely there are other examples from breweries farther afield some of which surely distribute here. Ooh! Widmer Brothers' Marionberry Hibiscus Gose. Can't forget that. 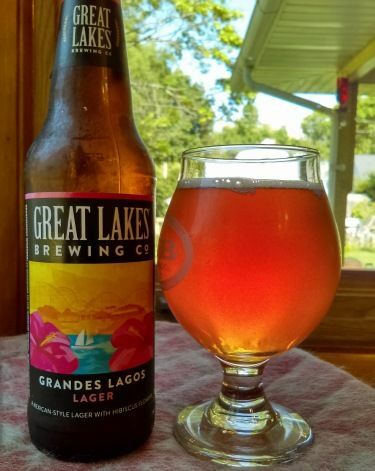 The latest hibiscus brew to come to my attention is Great Lakes Brewing's Grandes Lagos, a Mexican lager that spent some quality time with the tasty flower. It's a spring seasonal that I believe was introduced last year but only on draught so now folks farther afield can enjoy it. To be honest, I don't know what a Mexican lager is. Lakefront introduced one this year called El Wisco so perhaps this is something of a trend. With novelty being so highly coveted by the American microbrewing scene, every style will surely get 15 minutes of fame. After some limited investigation, my hypothesis is that a Mexican lager from an American microbrewer is a pale lager made with maize and generally given a name that begins with "El" or ends in "-ito" for that extra touch of authenticity. Grandes Lagos (i.e. - Great Lakes), like the last hibiscus beer I had defied my expectations and wasn't pink. Rather it was more of a pinkish orange and quite clear. Nothing much to report as far as the head goes. Small, white, and off like a prom dress. However, the brew was fairly effervescent with a decent number of bubbles inside. All in all, a pretty beer. My nose caught some popcorn, biscuit, and of course that lovely floral scent of the hibiscus. I suppose the point of a craft Mexican lager is that it helps you beat the heat by being light and refreshing. Grandes Lagos certainly is that with its light body, firm fizz, and solid crispness. None of the flavor here were particularly strong – there was a little corn to be tasted alongside a mild maltiness The hibiscus was complementary and not overpowering. It had a bright floral taste plus some tartness which went well with a mild grassy hop flavor. The floral tartness remained after the beer had gone down my gullet and it was joined by a little spicy hoppiness which was moderately bitter. Just enough to conjure a pleasant dryness. Not much lacing – just an occasional spot or two. Endowed with that essential aestival trifecta of being light, fizzy, and crisp, Grandes Lagos is made for the dogs days of summer. The corn and malt are pretty mild (but not too weak) so, while they are always there in the background, it's the tasty hibiscus that shines. I love their floral flavor and the gentle tartness they bring. Junk food pairing: Stick with lighter fare for Grandes Lagos. Try a bag of guacamole flavored potato chips or some white cheddar popcorn. 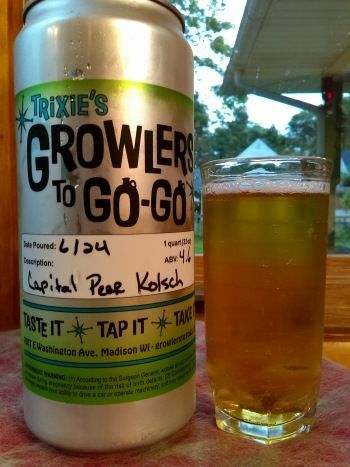 This was something of an oddity I found at Growlers To Go-Go recently - a pear Kölsch. I say odd not because Capital is a stranger to German bier styles because they're not; and not because pear Kölsch is some heretofore unknown exotic brew. Indeed, Capital brewed it a few years ago for a pre-Great Taste of the Midwest party and again last year. The Kölsch is apparently something of a fixation for the brewery's director of operations, Zach Faber, who has been honing his Kölsch for a few years now. No, what's got me flummoxed is that Capital released a non-pear Kölsch this past spring so either Growlers To Go-Go got things mixed up or Faber is continuing his search for the Platonic ideal of a pear Kölsch. Personally, I love the idea of adding some pear to the rather humble Kölsch. It's not that you're adding something novel because the style has native pomaceous flavors owing to its yeast. Instead you'd be bolstering the bier's built-in fruitiness to make it stand out. Well, that's my Platonic ideal, anyway. While I've never strolled the Straßes of Cologne and tasted the freshest Kölsches in their hometown, I am rather picky when it comes to the style. I prefer it to have a distinct, clean cracker taste along with a nice fruitiness that is part pomaceous, part berry-like. The ale yeast provides the fruitiness while ample lagering gives the crisp malty/wheaty taste. (Though I am told that the lagering process for a Kölsch differs from that of, say, a pils.) And for me the gold standard is Reissdorf. They balance these flavors perfectly like a well-mixed album where each instrument and voice has its own space yet blend together in a harmony. Capital is no stranger to German bier styles or lagering so I was quite looking forward to this brew. It lit my glass* up with its brilliant light yellow hue which, along with its clarity, made for a very attractive brew. My only complaint is that my pour managed only a small crown of white foam which dissipated quickly. Though there was a fair number of bubbles inside the glass. My nose got all excited taking in the requisite fruitiness, including pear. Not too strong, mind you. There was also some biscuit and a tad of grassy hops. The truth about whether this was a pear Kölsch or not would be revealed by my tongue. It discerned a light fruitiness which definitely had some pear as well as apple and that nebulous "berry-like" taste. Having said this, it didn't taste like there was any added pear; just the normal flavor you get from the yeast. There was also a little fizz and the wheat/malt. Unfortunately it was not the crisp, crackery flavor I crave in my Kölsch. Instead it was mushy, dough-like kind of grain taste. I liked how the fruitiness lingered on the finish as a mild herbal hoppiness made its presence known. Not particularly bitter but just enough to lend a little dryness. After emptying my pseudo-stange it was left with some Schaumhaftvermoegen - lots of spots and a few patches of webbing. I am no supertaster but will go out on a limb and say that this is not a pear Kölsch. The fruitiness just didn't seem stronger than I'd expected from a non-fruited brew. Regardless, I really enjoyed the fruit flavors here which included pear. My gripe is that the grains tasted doughy instead of crisp and crackery which muddles the overall flavor instead of giving everything room to stand on its own yet harmonize with each other. This tasted more like Gaffel or Sünner as opposed to Reissdorf which is not a hanging offense. Capital Kölsch is still very tasty. It's light and goes down easily. Plus the modicum of hops on the finish make for a nice contrast. Junk food pairing: A little salt helps bring out the fruity flavor here, makes it more distinct. But don't overwhelm your palate. Try some plain potato chips or regular Cheez Its. *My stangen are still packed away in the basement but my wife saved a mole jar and it proved an adequate substitute. Kansas City's Boulevard Brewing Company began distributing to Wisconsin back in the spring. I must admit that when I first heard the news, I wasn't excited. But this wasn't due to Boulevard, whose beers I was not familiar with; rather it was because of Pavlovian conditioning. I mean, it seems that the other breweries who have begun distributing here all brought an arsenal of eyepahs. (I'm thinking particularly of Golden Road.) Strolling down the beer aisle at Woodman's I'd see stacks of eyepahs by breweries new to the state – session, double, juicy, New England – the whole lot. And so when I heard about Boulevard's immanent arrival I couldn't help but think "Do these people not realize we already have dozens of native eyepahs that are just as bitter/juicy/fruity/cloudy as something imported from distant lands?" 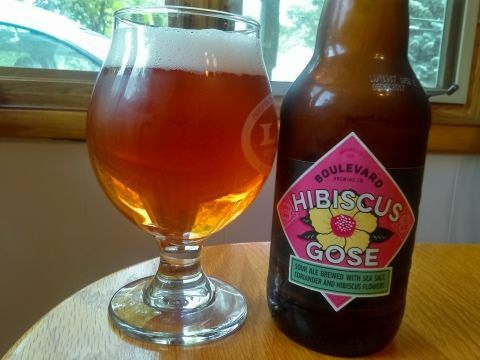 Then I did a little reading and discovered that Boulevard brews a hibiscus gose and a little excitement began to well within. Suddenly I recalled having had a hibiscus goes Dexter's one time but soon realized that it was Marionberry Hibiscus Gose by Widmer Brothers. While I expected Boulevard's Hibiscus Gose to be pink it was more orange – almost amber. Not sure how to explain that. Also curious was the fact that the bier was clear. Being a wheat brew it's normally a touch hazy but I suppose filtering highlights the color. I got a medium-sized white head which stuck around for a little while. Inside there was a modicum of bubbles. The aroma had that lovely floral scent of the hibiscus as well as some citrus from the lactobacillus. My tongue was greeted with a fairly big dose of sour that was moderately lemony. Then the hibiscus kicked in with a firm bit of the floral. The flowers also lent a tangy bitterness. I'd swear I caught just a hint of coriander, an ingredient I wish was generally more prominent in goses. Similarly, there was a tad of cracker underneath. The lacto and carbonation gave the beer a pleasantly acidic patina. The finish was wonderful with a hint of the hibiscus accompanied by a lingering tartness from the flower. It was here that the salinity became noticeable and it helped bring the coriander out of the botanic malaise and to the fore. Sadly there was no Schaumhaftvermoegen to be had. Delicious! I appreciated that the bier didn't have a lethal sourness. The lacto and hibiscus kept things nice and tart, though. Aside from adding some tartness, the hibiscus adds a tasty floral accent to the gose. I know some folks who are turned off by flowers in their food and drink. Unlike say, rose hips, hibiscus, at least in the beers I've had, has a taste that is brighter and less richly aromatic. The sour along with a light body and low alcohol – 4.2% - made it extremely refreshing on a hot day. This is a great bier and it was quite fortuitous that Boulevard began distributing here when they did as Hibiscus Gose is a spring seasonal. I look forward to next year's batch already. Junk food pairing: Pair Hibiscus Gose with something that tastes of warmer climes such as lime flavored tortilla chips or guacamole Takis.